The Secret Room hosts the famous 'Secret Room' gifting suite in honor of the 66th Emmy Awards happening on Monday, August 25th. Held at the Montage in Beverly Hills the suite was packed with socialites, media, and celebrities stocking up on last minute 'wins' to prep for the big day. Factory 99 is the future of eyewear. Founded over 75 years ago in Japan, this brand has been continued by three generations of the Aoyama Family and is the world's number 1 acetate manufacturing technology. These 3D designs have been making a huge impact worldwide. Yatra is a boutique clothing line that ties in with social mission work. It supports the work of various artisans in India who in turn support extended families and local communities. Vanda is known for its energy cleanser that clears stagnant energy, negative energy away from you using powerful ancient wisdom. This positive mood changer is known to empower, awaken, and rebalance. Skineez is fabric that has been pre-treated with healthy cosmetic nutrients such and anti-aging ingredients including: retinol, caffeine, shea butter, and vitamin a&e. Rago shape wear made from light to extra-firm compression that shapes the female form in the most flattering and comfortable way. Finally breathable, fashionable, and comfortable shape wear that actually works. Schmoozies had cute dog collars that were bedazzled for every size dog. For every one sold, one is donated to an animal shelter. Epic Pet Health had a variety of natural supplements in order to improve the health and well-being of your furry friend. 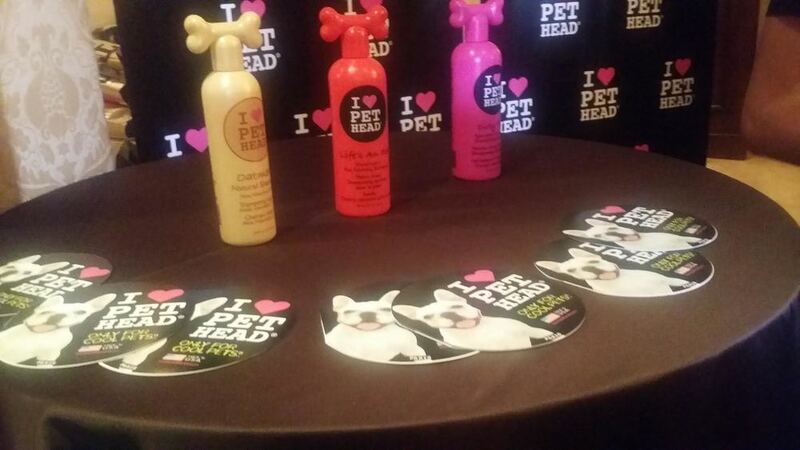 Pet Head is an extension of 'Bed HEad', and provides the same caring products such as pet shampoo and teeth whitening but for pets. Alaska's Bakery are 100% organic, veterinarian approved, gourmet dog treats, with a portion of sales being donated to animal welfare charities! 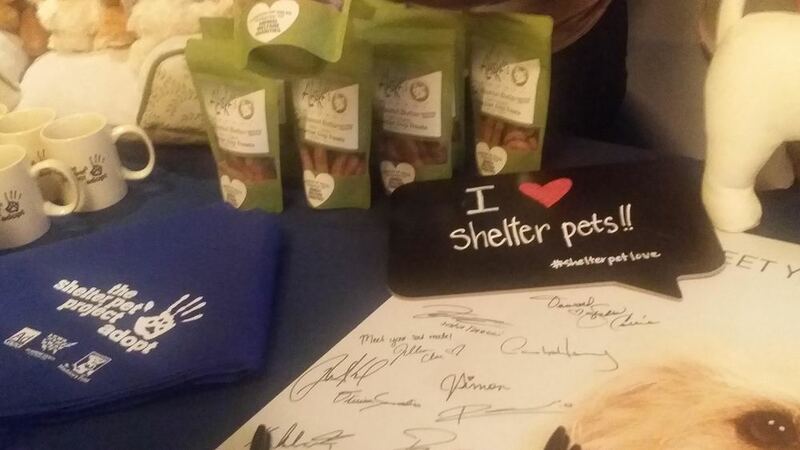 Each guest received a bag of peanut butter treats for man's best friend. Finding Vegan had a vegan smoothie book for guests to take home. Our Angels had inter nation psychic, Gloria Layne Bieber, on site to read your energy. Littlest Pet Shop had a full on display of the newest kits and characters of the line. This was a favorite stop for guests of all ages. Guests were able to taste Chuao chocolates while walking throughout the gift suite. St. Kitts was on site showcasing the breathtaking travel destination. Faucet Face is an eco-friendly reusable glass water bottle that had three different designs on display for guests to choose from. Ashieda had its one mask that does it all on display. This natural anti-aging mask provides hydration and skin renewal. Benefits of this mask includes: beautiful, younger-looking skin reduced pores, clear skin, even skin tone, improve elasticity, increase moisture, brighten skin, reduce wrinkles and fine lines, produce youthful glow, and stimulate collagen. Ora Dentistry Spa had Dr. Saleh on site to discuss the importance of healthy gums and teeth. Dr. Sam Saleh is a world-renowned cosmetic dentist in Beverly Hills. As exclaimed by NeNe Leaks and Tyra Banks, Dr. Saleh is the trusted man who is also a life changer, and also happens to be awarded one of 'America's Top Dentists'. Additional sponsors include: Wiki Wags, Hape, Whill, Cupcake Sushi. The Secret Room gifting suite not only had everything for individuals to prep for the craziness of the weekend, it also had everything for our furry friends as well.